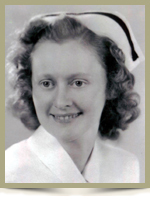 Martin, Olive Grace, 90, of Caledonia, Queens County, formerly of Mapleton and Amherst, Cumberland County, passed away peacefully on April 1st, 2014, at North Queens Nursing Home, Caledonia. Born in Mapleton, she was the daughter of the late Knox McElmon and Elizabeth A. (Austin) Lodge. Olive was a member of the Caledonia United Church and the United Church Women. Prior to her marriage she was a registered nurse. She is survived by a son, Stephen and his wife Jeanne, of West LaHave; brother-in-law, James H. Steele, of St. John’s, Newfoundland, a number of nieces, nephews and cousins. She was predeceased by he loving husband W. Harris and a sister Frances M. Steele. Stephen and Jeanne Please accept our sympathy at this most difficult time. Sorry to hear of the passing of Olive my sympathy to you .God Bless! Our deepest condolences on the passing of your dearly loved mother. Our thoughts and prayers are with you through this difficult time. Please accept our deepest condolences. Olive was a lovely lady and will me missed. Stephen and Jeanne, please accept our deepest sympathy in the loss of Stephen’s mother, Olive. A pleasant, and reserved lady, she was of the kindest in nature one might wish to know. Your loss will be great but with time, the best of memories will come to the fore and you will accept her passing as one where she has gone to a peaceful rest. Our sympathy to you and yours at this time. Stephen and Jeanne, Please accept our condolences,and we are thinking of you both as you go through this difficult time. We will miss Olive as i would spent time walking with her just prior to her short illness She always had something to tell me with her sense of humor that would make me laugh. We will miss seeing you and Jeanne coming to the home to visit. Stephen you have spent a lot of time visiting both your parents and were so dedicated. When we lose a resident which is part of our family we also lose the loved ones families that also have become part of our big family May God bless you both as you move on in life and remember the good memories in hopes those memories will help you deal with the pain you have in your hearts now. So very sorry for your loss.I have known Olive a long time and she will be missed by all who knew and cared for her.Always enjoyed chatting with her and having an afternoon coffee together. Take care. So sorry for your loss. Our thoughts and prayers are with you and Jeanne. Memories are wonderful; we just need to hold on to them. Please accept our deepest sympathy on the passing of your Mom. Our thoughts and prayer s are with you at this difficult time. Am thinking of you at this difficult time. Staff at nursing home could pretty much set our watches on olive at 2 pm that she would be coming for coffee and a cookie. We(staff),her extended family will also miss your mom. Take care, and remember, your mom is at peace now. mom, Stephen & Jeanne. My thoughts and prayers are with you at this sad time. Stephen and Jeanne ; With deepest sympathy on the loss of Stephen’s mother. Stephen and Jeanne, please know how sorry I am for the passing of your Mother,Stephen. I will always remember her thoughtfulness and care. The Maritime Conference United Church Women extend deepest sympathy on the loss of your loved one, Olive. May you always keep the memories of Olive in your heart and treasure them each day. May the love of God surround you to comfort, strengthen and give you courage to face the difficult days ahead. May you feel the love and caring of your UCW family and know that they are there to support, strengthen and give you encouragement. Stephen and Jeanne, so sorry to hear of the passing of your mom. Sorry to hear of your mother’s passing. A neighbour gave us the following poem when my mother passed away. I think it says so much and I want to pass it along to you now in hopes that it helps in some small way. I still read it often for comfort and solace. I have not gone, I have only slipped away into the next room. Nothing has happened, everything remains exactly as it was. I am I, you are you, and the old life we lived together is untouched, unchanged. Laugh at the little jokes we shared together. Let it be spoken without effort, without the ghost of a shadow upon it. Life means all that it ever meant, it is the same as it was. Stephen and Jeannie – we were saddened to hear of your mom’s passing and would like to send our deepest sympathy to you both. Take care and we will remember you both in our prayers.